Niki Jedlika is something of the Pauly Shore of the online poker world: Rumors abound about Jedlika, “He’s broke”, “He’s dead”, “he’s living on a deserted island he bought with his winnings”, basically if you can think of it, it has probably been said about Niki Jedlika! 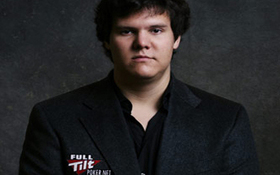 Jedlika burst onto the online poker scene at Full Tilt Poker, and after an initial good-run at the nosebleed tables, Jedlika was decimated, losing the millions he had made, and basically disappeared from the poker world. The name Niki Jedlika, or his Full Tilt Poker screen-name KaiBuxxe, was the topic of numerous threads at the online poker forums. Well, it appears Jedlika has moved on to greener pastures, and he now frequents the high-stakes poker tables on PokerStars, in addition to being a Full Tilt sponsored pro now playing under the name Niki Jedlika. On PokerStars Jedlika plays under the screen-name ‘RealAndyBeal’, and he recently took on one of the best PLO players in the world, Andreas ‘skjervoy’ Tobergsen and was able to relieve the Fin of over $500,000 in a single session. According to HighStakesDB.com, Niki Jedlika is down nearly $3.3million on Full Tilt poker, while Kaibuxxe was up nearly $3.2 million. Unfortunately HighStakesDb.com does not track PokerStars. This entry was posted on Monday, October 25th, 2010 at 3:14 am and is filed under Poker News. You can follow any responses to this entry through the RSS 2.0 feed. You can leave a response, or trackback from your own site.